Become famous with myDaVinci's In-Masterpiece series of artworks. 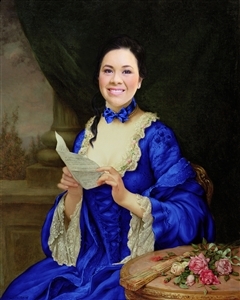 Based on your photo, our talented graphic artists will seamlessly place her into this timeless masterpiece entitled “The Love Letter”, originally created by French painter Francois Martin-Kavel (1861 - 1931). Changed the colour of the dress for a small fee in this masterpiece. Absolutely unique and makes a truly personalised gift.